To reduce the need of costly repairs, proper maintenance and care is the key to keeping your washing machine running for years of trouble free service. Improper use will cause your washer to overwork by using more electricity to wash the same load of laundry than if properly maintained. 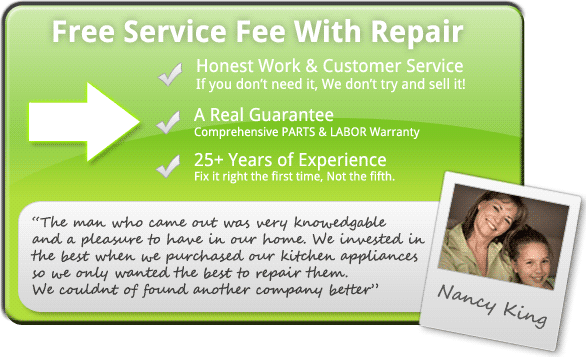 By following these tips, you can prolong the life of your washing machine and avoid a visit from us here at Nashville Appliance Repair. A level washer keeps the unit from operating off balance. Make sure that the washing machine�s feet are level to prevent an imbalance in the machine that may cause loud noises and added wear. This is the number one secret to washer longevity! Don't get greedy with your load. Overworking your washer today means buying a new one tomorrow. Don't use too much detergent because too many soap suds will cause the washing machine to work harder and use extra energy. Detergent dissolves in water temperature over 55 degrees F.
Make sure your water faucet hardware is in good condition. Connect to them carefully; improperly threading hoses to the faucets can cause major leaks and water damage to the home. Did you know that turning faucets on and off before and after you wash can extend the life of you hoses? This also prevents hard water buildup, which will reduce the life of the hoses. Rubber Hoses, over time, get worn out, brittle and leak. It is recommended that hoses be replaced every 5-7 years. They are not expensive, and are worth the trouble. Be sure that your drain hoses are not impeded from draining. Remove kinks and other stoppages. Improper draining may cause the pump motor to overheat and burn out. Find out more about washer energy efficiency.